I’ve already shared my Easy Mirror Glaze Recipe (made with only 5 ingredients!! 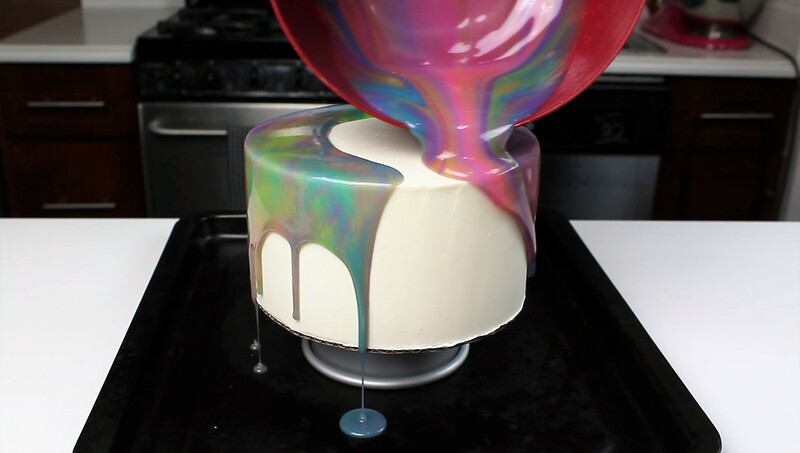 ), which helped make the mirror glaze technique much more approachable. However, I wanted to simplify the process even further, and am now sharing a modified mirror glaze recipe that can be prepared using just a microwave!!! Microwave Mirror Glaze needs to be a thing! I’m not kidding, this take roughly 5 minutes in the microwave to whip up. I’m 99% sure this is the simplest mirror glaze recipe out there! I wanted to make a mermaid-inspired mirror glaze, so I used some light shades of pink, purple, blue, and green. In addition to making microwave mirror glaze a thing, I also want to make mermaid glaze a thing! So many goals, so little time. Be sure to pour the glaze over a fully frozen, very smooth cake. I prefer to pour this over cakes frosted with buttercream, but you an also pour it over frozen mousse. Mix the gelatin in a bowl with 1/4 cup of water, and set aside to let it bloom while you begin the glaze. Combine together the 1 1/2 cups of sugar, 1 cup of water, and 2/3 cup sweetened condensed milk in a heat-proof bowl. Heat for 1 minute at full power, and remove from microwave. Stir, and heat for another minute. Next, add in the gelatin (it will be very firm), breaking it up into smaller pieces. Heat for an additional minute, then add in the melted white chocolate. Slowly stir, until the white chocolate is fully incorporated. The glaze should be perfectly smooth, and roughly 130 degrees F at this point. If there are still bits of white chocolate, heat for additional 30 second intervals (stirring between), until all the chocolate is fully incorporated. Divide the glaze evenly between four bowls. Color the bowls pink, purple, blue, and green. Continue to stir occasionally to stop a skin from forming, until the glaze has reached 90 degrees, or is slightly above room temperature. My glaze took about 20 minutes to cool to the right temperature. Once the glazes have cooled slightly, pour all of the pink into a large bowl with a pouring spout. 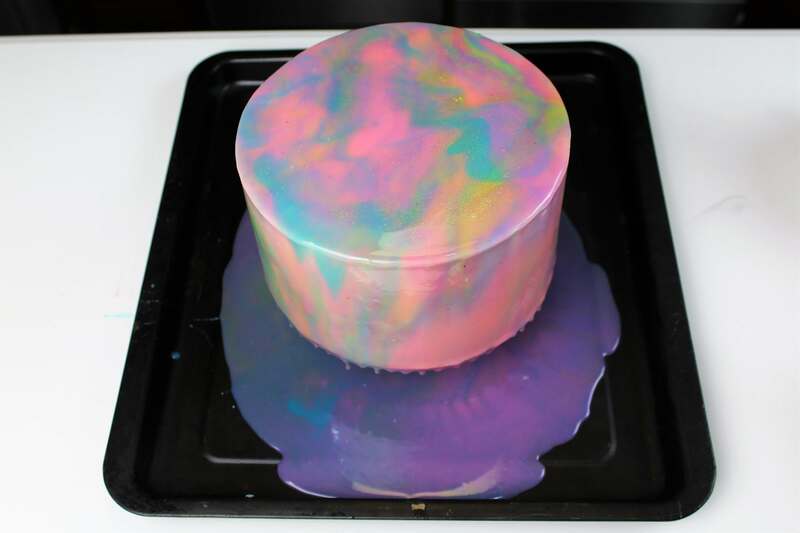 Then pour drizzle in 2/3 of the purple, blue, and green glazes on top of the pink. Although the traditional mirror glaze recipe involves more ingredients and additional equipment, this easy, 5 ingredient recipe makes the technique way more approachable. I was shocked by how quickly I was able to make this, and how easy it was to do. Traditionally mirror glaze cakes involve pouring the glaze over a perfectly smooth, mousse-covered cake. I experimented, and found that you can easily pour it over a classic buttercream cake, as long as the frosting is extremely smooth. I elevated my cake with a a small cake pan, then slowly poured the glaze on the cake. Begin pouring the onto the center of the cake, then slowly work your way out to the edges. Once the cake is fully covered, sprinkle a line of edible glitter over the top. Swipe a bit more blue onto the top of the cake with a large offset spatula, and sprinkle some edible glitter over the top. Let the glaze continue to drip for about 10 minutes, then placed the cake in the fridge. See? So easy!!! My cake was a three layer cake made with seven inch cake rounds. This glaze recipe easily covered a cake this size, and I had plenty of leftover glaze. It can be stored in the fridge in an airtight container, and reheated to be used in the future. However, the glaze can develop a skin, so be careful! A mirror glaze is a classic french technique that can seem quite intimidating!! I've simplified my mirror glaze recipe to make it super easy to make, and it only uses 5 ingredients!! It also can be made using just a microwave! Begin by mixing the gelatin in a bowl with 1/4 cup of water. Set aside to let it bloom while you begin the glaze. Pour the sugar, 3/4 cup of water, and sweetened condensed milk in a heat proof bowl. Heat for 1 minute on high power in the microwave. Remove the mixture, and stir to incorporate the ingredients. Pour in the bloomed gelatin, and stir until it's fully dissolved. Melt the white chocolate chips in microwave by heating and stirring in 30 second intervals. Once the white chocolate is fully melted, pour the chocolate into the warm gelatin mixture. Carefully whisk mixture until fully combined. Continue to stir occasionally to stop a skin from forming, until the glaze has reached 85 degrees, or is about room temperature. Divide the glaze evenly between three bowls. Color them different shades of green using gel food coloring. 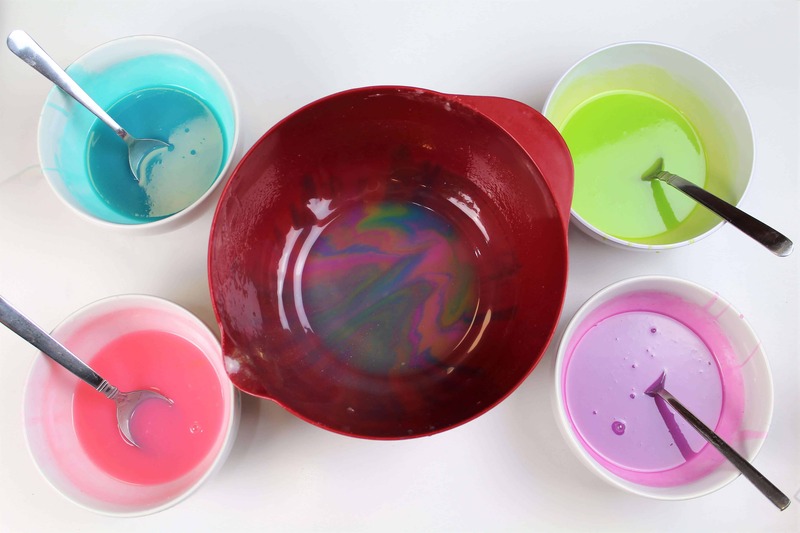 Once the glazes have cooled slightly, pour them back into one large bowl, alternating colors and drizzling the colors together as you combine them. Place fully chilled buttercream cake (chilled in the freezer at least 1 hour) on top of a circular object smaller than the cake board, and set this on top of large baking sheet (to catch the run-off glaze). 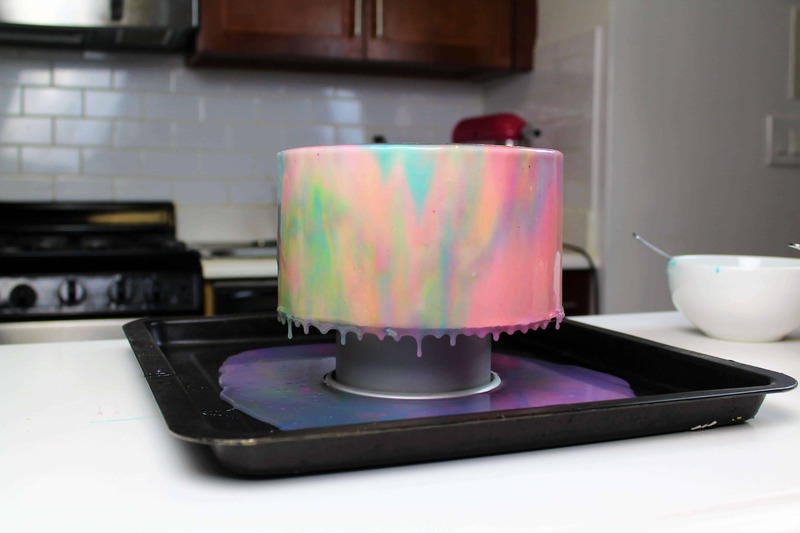 Begin pouring the glaze onto the center of the cake, then slowly work out to the edges of the cake in a circular motion. Let the glaze continue to drip for about 10 minutes, then scrape away excess glaze from the bottom of the cake board using a small offset spatula. Place the cake in the fridge, to allow the glaze to set, and to slowly thaw the cake. you state that the glaze develops a film. So do you recommend glazing day of party or can you store it in the refrigerator over night and it be okay? Thanks! it’s best to do it day of if possible, it loses some of it’s shine if the fully glazed cake sits overnight! I’m not sure, I’ve never tried that before! i used a swiss merinque buttercream and when i glazed it the glaze didn’t seem to want to stick to spots on the edges…any idea why? cheers! Lol…guess I was too impatient! How long does the glaze keep, and how would you recommend reheating the glaze? I did a trial run today for a birthday cake next weekend, and I have a TON of glaze that I would love to just save and use later this week. Is it possible to use this glaze on a fondant covered cake ? I don’t receive many requests for butter cream cakes. I’m not sure, I’ve never tried it! Can you use colored candy melts instead of white chocolate chips? I would like to use white candy melts so was hoping that would work, any thoughts? You can! I’ve never really used them, but I’ve heard you can sub white chocolate for candy melts! I prefer the taste of white chocolate though! Just made my third mirror glaze cake using your recipes. The first two were spectacular. I used the stovetop method for the glaze. This one I used the microwave, and wasn’t as happy with it. The temp never got up to the 130 that you mention initially, only about 90. At least it got to room temp much quicker! Then when I poured it, it was thin and had tiny bubbles, even though I had sieved it to get out any lumps. I think it will be okay, since I was making it for a friend’s kid and he wanted some white in it (the frosting is showing in places). Not sure if it was because I didn’t get it hot enough initially, do you think that the gelatin needs to be hotter to activate it? Anyway, I will probably stick to the stovetop method in the future. I’m sure it was operator error, just wondered if you had any ideas about what went wrong. I used your vanilla cake recipe and it tasted great (of course I had to taste the trimmings!!). Thanks for all of the ideas. I almost went into a sugar coma just looking at the S’Mores cake pics! I am tempted to try it, but if you have input on the difference I’d love to know! it does lose it’s shine overtime, which is the downside to omitting the glucose! however, it makes this type of recipe so much more accessible to all the home bakers out there, which is why I’ve chosen not to use it. I have yet to try the spider web method, but I’ve been wanting to for a while!! Thank you so much! you are right, it simplifies it a lot and depending on what you are doing, why not, right? Thank you so much for your videos @Chelsweets.. It will be my first time making a mirror glaze, any advice? ? I’d recommend just following the measurements to a T, and making sure your cake is fully chilled before you pour the glaze over it 🙂 best of luck!